Thinking about a new roof? If you’re planning to use COLORBOND® Steel for your home, you’ve already made the best choice. We want to talk everything ‘COLORBOND®’ including the benefits and which colours to choose to suit your home and climate. Read on for our top considerations for using COLORBOND® roofing for your home in Adelaide. COLORBOND® is a sheet of steel, which then has a coloured surface baked on to prevent the steel from rusting; this gloss colour finish enhances home and gives it an extra layer of design as well as function. 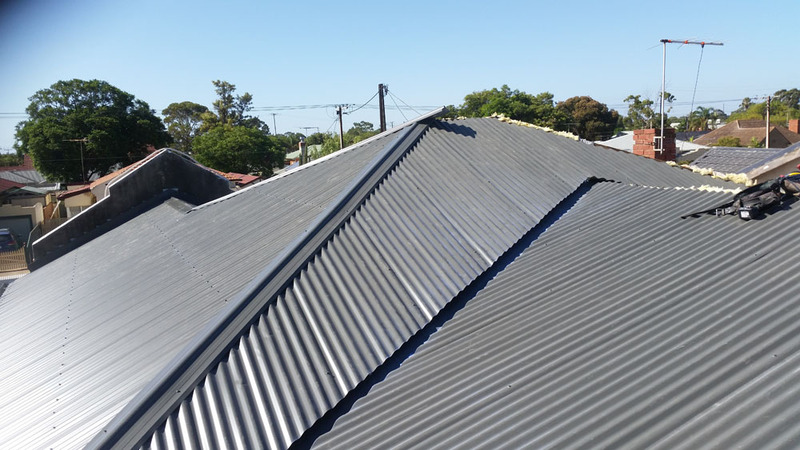 Steel is strong and lightweight compared to some other roofing materials and has been specially developed for Australian conditions to handle the insufferably hot days and cooler nights. COLORBOND® outperforms other roofing material available simply with its innovative technology. With more and more environmental awareness and advancements in building codes and regulations, COLORBOND® was made to help homeowners save on their energy cost, without compromising on style and design. COLORBOND® Steel is thermally efficient, when properly installed, ensuring your home stays a level temperature throughout the year. Properly insulating the COLORBOND® Steel also helps reduce noise caused by rain falling on a steel roof. Just about every colour in the COLORBOND® Steel range qualifies as solar reflective, and features the Thermatech solar reflectance technology; helping your new roof remain as efficient as possible. COLORBOND® Steel is also recycled steel and is itself recyclable. It’s lightweight, cost-effective, and its durability is legendary. COLORBOND® roofing is also ideal for rainwater harvesting as water isn’t absorbed by steel as it is by some types of roof tiles, it also doesn’t trap dirt or dust. COLORBOND® is one of the leading, top-quality building materials and they work tirelessly to maintain this accolade. Equipped with a sturdy, corrosion-resistant steel base and reliable topcoat; to ensure peeling, fading, cracking, and chips won’t occur on your roof. With interlocking panels, COLORBOND® ensures that it will remain rust and corrosion free for the lifetime of the product. Your roof will be in place and functioning at its peak for up to four times longer than traditional roofing materials. COLORBOND® is also popular with designers and renovators alike, looking to brighten their home. COLORBOND® allows for transforming dull and tired to bright and efficient with COLORBOND® which can make a huge difference to any home. The lighter colours in the COLORBOND® range have the ability to reflect heat so are great in summer for keeping your home a little cooler. The lighter colours are perfect for warmer climates across the country. As a bonus, the light colours help reduce your energy bills and extend the life of your air conditioning by reducing the need for it. Cooler climates would be better with darker colours for the opposite effect. COLORBOND® is non-combustible and boasts increased fire protection; making it the sensible choice for bushfire areas. It can also be applied to gutters, downpipes or as walling, giving your home that extra layer of protection. It’s easy to maintain! COLORBOND® only needs a hose and brush down every so often if sticks or leaves appear. So when you clean your gutters, give the roof a quick hose off and away you go! COLORBOND® roofs are maintained naturally with rainwater clearing most debris off the roof without an issue. Although if you live along the coast, you’ll need to give the roof a more frequent wash off with the hose due to the sea spray. Cool scope you’ve got here. It’s nice that you have discussed various types of materials. It’s essential to get familiar with this. My brother’s roof is about 17 years old now and it’s about time for him to find a roofing company to replace it. I think he would really appreciate your information on Colorbond roofing material and how it performs against traditional material. The fact that it does a better job of both reducing noise and increasing energy efficiency is amazing.